How about a thread devoted to newly purchased GEC pieces? They seem to be spread out among other threads. Who wants to lead off? vikingdog wrote: How about a thread devoted to newly purchased GEC pieces? They seem to be spread out among other threads. Who wants to lead off? Your postman should get combat pay for delivering your mail or maybe he should get paid by the pound. Either way, he'll develop a hernia soon if you don't lighten up on the orders. 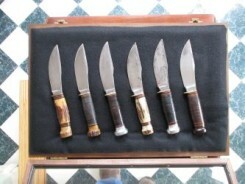 By the way, those are some mighty pretty knives! All nice knives, But that genuine stag on Monks stockmen Is frickin amazing! Drool! "Aint no fun when tha Rabit got tha Gun. " I carry,a #48 (Ram's Horn) , and @3 7/8,they are very pocket friendly!!!!!! Jason I've got several edc knives that I could not find any thing wrong with...their QC must really be strick. Lookin' Good,Bob_______that little, Barehead Jack , is a real sweet one ___it's good to have ya' back,posting some of that"'Eye Candy"" that you collect !!!!!!!!!!!!!!!!!! Now that's what I'm talkin' about. Monk, I'm glad you started things off. Some beautiful knives here, that 56 jack is amazing WelderBob. Come on Jason carry that beauty! Don't you want to have it with you? I sure would. All nice stuff, but I gotta say Welderbob's pair of stags is just about a perfect couple of pocket knives. Please tell me you're gonna carry those!